Colorado has a colorful history, and the state is full of myths, rumors and legends that are still unexplained. Some legends go as far back as when the Native Americans roamed the land or when Spanish settlers claimed the territory near the Rio Grande. The state’s century-old hotels have become known as some of the most haunted places. Legends center around the eclectic pasts of these vintage establishments. After a stay at the Stanley Hotel in Estes Park, Stephen King was even inspired to write his famous horror book-turned-movie The Shining. Embrace Colorado’s creepy side with these 10 myths and legends. Riverdale Road in Thornton is allegedly where satanic worship and murder took place. The “Gates of Hell,” the rusted, iron gates found on Riverdale Road, have grown to be a famous spot along the spooky 11-mile track. Visitors to the “Gates of Hell” allegedly have heard screams and seen ghostly figures of a boy and a lady in white. The Ridge Home Asylum in Denver housed mentally-disabled children, adults and senior citizens from 1912 to 1991. Rumor has it that the patients here were mistreated by hospital staff. Now the original building is no longer there, but there have been reports of shadows and voices still haunting the area. Quite possibly the most famous haunted place in Colorado, the Stanley Hotel in Estes Park is a beautiful hotel that inspired Stephen King’s book The Shining. 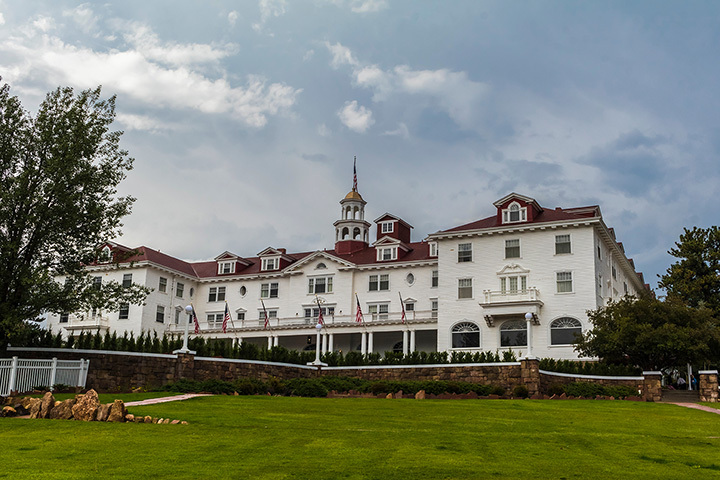 Guests at the Stanley Hotel allegedly see ghostly figures of former guests, hear sounds of crying children or experience odd and unexplainable phenomena. Opened in 1893, The Hotel Colorado is known for its spooky rumors, dark past and unexplainable happenings. During World War II the two huge ovens in the hotel’s basement were used for cremations, and then the hotel was converted to a hospital for the Navy. Guests claim to have seen lights unexplainably turn on and a little girl roaming the halls. A jogger was allegedly hit by a car and left to die at the hill on Riverdale Road in Denver. This tragic tale has turned into a mysterious haunting. Apparently the runner is out for revenge. Some claim to have seen a ghostly figure haunting the area and handprints on car windows. The white-tent peaks making up the structure of the Denver International Airport has apparently inspired this myth. Some believe that Denver’s airport is the home of a New Order, neo-Nazi headquarters. The art in the airport has been viewed as New World Order propaganda, and there are rumors that hidden buildings are underneath the terminals. The legend of La Llorona is a popular Spanish legend about a ghostly woman that walks near rivers weeping and looking for her lost children. Some claim to have heard La Llorona along the Rio Grande river in the San Luis Valley. Buffalo Bill’s Grave and Museum is one of the most popular visitor destinations in Colorado. Located in Golden, Buffalo Bill’s Museum opened in 1921. The area is said to be haunted. Some visitors claim to have seen a ghostly apparition of a cowboy, white mist appearing out of nowhere and other unexplained phenomena, like dolls jumping off the shelf in the gift shop. The Third Bridge, located in Aurora, crosses over the Kiowa Creek. Apparently a lot of lives have been lost in the area from a Native American massacre to fatal car accidents. Witnesses of the hauntings here at the Third Bridge claim to hear drums, horse hooves and screams. Some have even allegedly seen ghostly figures of Native Americans and phantom cars. Located in Boulder, the Hotel Boulderado has been serving guests for nearly 100 years. There are rumors that Rooms 302 and 304 are haunted. Witnesses have apparently experienced strange things in the two rooms such as the appearance of apparitions, lights switching on and off and the sound of disembodied voices. In 1924, an attempted double-suicide occurred with one death, possibly spawning the spooky rumors here at the Hotel Boulderado.